Cost-effectively deliver digital streaming video, audio, lectures, tutorials, documents and more straight to every classroom computer, television or students' homes or workplace. 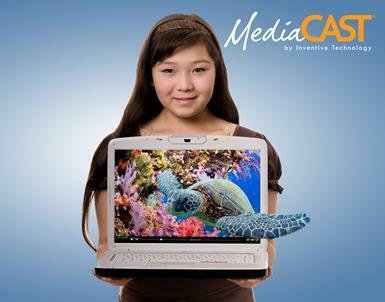 MediaCAST utilizes web-based technology and the latest streaming technology to deliver stunning, broadcast quality learning content to hundreds of students simultaneously. Provides teachers with the ability to incorporate any audio, video, document or graphic images into curriculum presentations of their own - even Power Point slides and Excel spreadsheets! Easy to use wizard provides teachers the ability to upload media resources to the searchable library from Internet-enabled computers. Archive live broadcast presentations for students and other faculty to view at their convenience. Allows students, with permissions, to access digital content from anywhere in or outside of the school providing students with the ability to progress with course work at their own rate and review materials as often as needed. Makes it easy to find content that correlates to your particular state standards. Start with the Core MediaCAST Digital Platform, and then add Seamlessly Integrated Modules (SIMS) at any time! Let MediaCAST show you the way!